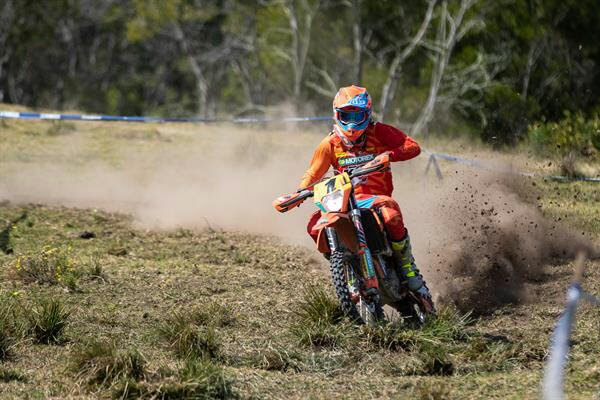 KTM Enduro Racing Team’s Daniel Milner has dominated rounds five and six of the 2018 Australian Off-Road Championship (AORC) at Dungog in New South Wales, establishing himself as the rider to beat as the series resumed for its second half of the season. Reigning national champion Milner was untouched on his KTM 500 EXC-F across both days of Enduro format action, excelling in dry and dusty conditions. That form saw him maintain his perfect season in the E3 division, while also leading the way outright following six rounds. Saturday saw Milner put forward a commanding performance, lodging a total time of 45m44.564s, positioning him over 30 seconds ahead of his closest challenger. He was even stronger on Sunday in a repeat of results, extending an overall advantage of over 1m40s. Teammate Lyndon Snodgrass rode his KTM 450 EXC-F to third in the E2 class on both days, despite one of his more difficult weekends of competition. Snodgrass displayed his share of speed around the grass track test, however was unable to maximise on his time through the trail sections. Milner now holds a 27-point lead in the E3 points, while Snodgrass sits third in the E3 category, 26 markers outside of the lead. The AORC series will now travel to Broken Hill, NSW, for round seven between 1-2 September.